Gillette Fusion ProShield men's razor, with lubrication before & after the blades, shields from irritation while you shave. It features 5 precision blades for incredible comfort. With Gillette's thinnest and finest blades (first 4 blades, same as ProGlide), ProShield allows less tug & pull vs. Fusion. This razor comes complete with a Precision Trimmer on the back, great for edging tough areas such as under the nose and sideburns. Complete with FlexBall technology, ProShield responds to contours & gets virtually every hair. One razor blade refill equals up to one month of shaves. This Fusion ProShield razor can be used with any Fusion blade refills. Lubrication before & after the blades, shields from irritation while you shave. Gillette razors for men with 5 Anti-Friction blades; a shave you barely feel. Precision Trimmer on back, great for edging tough areas (nose and sideburns). Razor with FlexBall technology, ProShield responds to contours and gets virtually every hair. MicroComb that helps guide stubble to the blades. 1 razor blade refill equals up to one month of shaves. Fits all Fusion5 and Fusion5 Power blade refills. Gillette Fusion5 ProShield razor for men features 5 anti-friction blades for a shave you barely feel. With lubrication before & after the blades, it shields skin from irritation while you shave. It features a handle with FlexBall technology which responds to contours and gets virtually every hair. The Precision Trimmer on the back is great for hard-to-reach areas and styling facial hair. One razor blade refill equals up to one month of shaves. 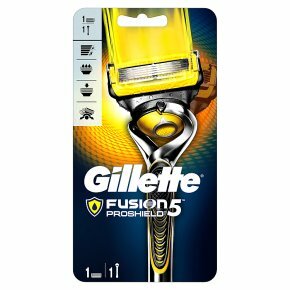 Fusion5 ProShield men's razors fit all Fusion5 blade refills. Gillette razors, formerly called Fusion ProShield.